Our debut product is made to lead a line of tools that introduce a new meaning to depth in compositing. The ZbornToy has the ability to extract a maximum of information out of simple depth images and allows you to not only light and texture them, but to refract backgrounds, cast caustic reflection back onto the background and a whole lot more. The design of ZbornToy has the amount of parameters reduced to a minimum, while still providing a vast amount of control over every aspect of it. The goal has been to achieve the performance and feel of a full blown render engine when it comes to the results. Yet it is ment to be not only easily accessible, but fast and fluent so that it is fun and even playful to use. Lighting supports shadows and soft shadows and is kept within the plugin for a maximum portability to other compositing packages that support after effects plugins. Sources of light are by means of a direct light, a point light and environmental illumination. The environmental illumination is based on panoramic or spherical maps. 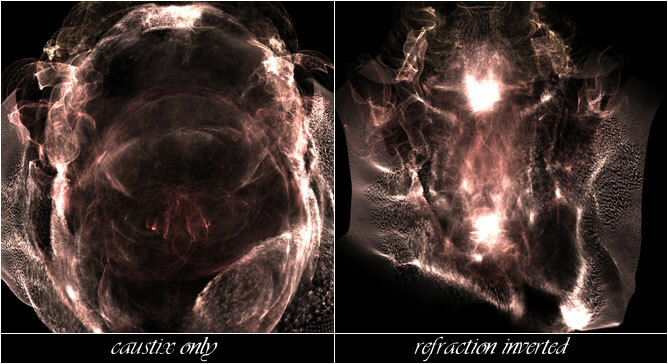 It includes occlusion approximations and independent reflection settings. The reflection is directly tied together with the shading section and gets diffused and colored according the surface definitions. The shading section offers a set of innovations that simplify the shading process dramatically, while keeping the look of the surfaces stunningly coherent. 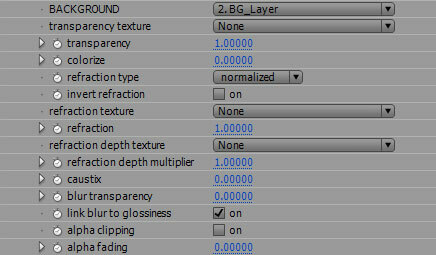 For example, defining the glossiness of a surface requires nothing more than to dial or texture the glossiness parameter. Everything related to the look of a glossy surface automatically responds accordingly based on both mathematical and artistic understanding of the required process. The amount of paramters is destilled down to a minimum while maintaining a maximum of flexibility to easily create all sorts of materials ranging from the usual plastics over metal to particularely skin, supporting translucency in the easiest to use ways ever. And all of the above is computing practically at realtime. Taking advantage of After Affect's adaptive previews, you can dial in your paramters and adjust lighting and textures while looking at the results. We are very used to having medium resolution renders (800x800) done within 1 to 3 seconds per frame. A final quality section allows for high profile results through a set of innovations in reading and projecting refractions and alternative oversampling options. pick topic for full description!